Quick flick reveals: This is technically not a lost book, as it was recently republished by Capuchin Classics, a company that specializes bringing back to life semi-forgotten books of interest. Not many people seem to have noticed, however, and so I don't have too much of a problem with including it here. 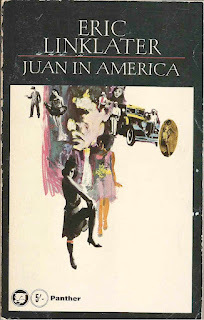 Another bawdy picaresque (a genre that raises its engorged purple head quite often in the Lost Book Library) about a horny European shagging his way around the US in satirical fashion, this actually might just be a proper, good book that people forgot to read for a bit. The type is certainly small enough to suggest that, anyway. Or, to quote J.B. Priestley's review, it looks like it is 'magnificent frolic'.